Remember last November when we found a crack in the Hensley hitch? We took it to a local welder in Del Rio TX and got a quick fix on it. Well, of course that wasn’t the end of the story. For years I’ve been saying that the hitch was due for a complete overhaul, so I took the opportunity this summer while the Airstream is parked in Vermont. I removed the hitch and toted it across Lake Champlain to Colin Hyde Trailer Restoration. That poor hitch was looking pretty awful. The orange paint flaked off a long time ago, and I’ve been patching it periodically with silver spray paint. It was a patchwork of rust, flaking paint and grease. From prior experience I knew it would have a broken internal bushing (the “binocular” part) and during inspection Colin and I spotted elongated holes in various places. So I called up Hensley and ordered every part that was worn or which might fail in the future, which included 8 bearings, the “binocular” bushings, some new U-brackets, dust caps, spare zerk fittings, and even a full sticker kit so we could make it look like factory-new again. That was about $250 in parts (they threw in the stickers for free). Now, Hensley doesn’t have a recommended service interval, so owners are left to their own judgement as to when an overhaul is due. I think I waited too long. It has been seven years and certainly well over 70,000 miles of towing since we got this unit (itself a replacement). Colin called me a couple of days later to say that mine was “the worst” Hensley they’d ever seen. Apparently the battered nature of my hitch was the subject of some amusement over at the shop. The bushings were broken not just once as expected, but into three separate pieces. The chrome had been worn off the hitch ball. 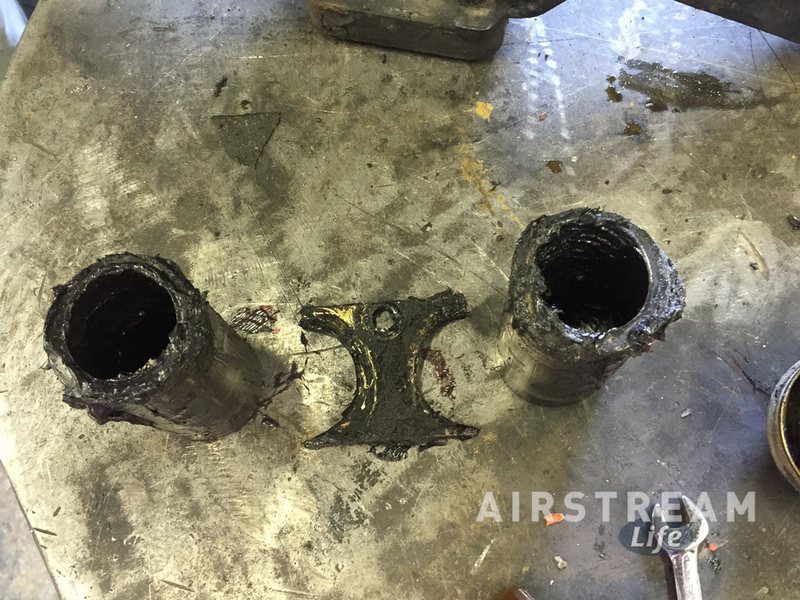 One of the lower bearings had rusted (due to water intrusion through the dust cap). That crack we thought we’d fixed? Now it was three separate cracks running across the bottom unit, hidden by a layer of dried grease. Worst of all, the tubes that accept the binocular bushings and weight transfer bars had stretched. Now they are oval, to the tune of about 1/10 of an inch and they have separated from the main body. The new bushings won’t even fit in. So, after Chris spent some time at the shop degreasing and sandblasting away endless layers of paint, it was decided that the entire lower section of the hitch needed to be sent to Hensley for warranty repair. They received it this week, and have promised I’ll get it back well before it’s time to hit the road in later July. Colin says they’ll take one look at it and decide to melt it down, but I think Hensley will repair it. It will be interesting to see what comes back. Meanwhile Colin’s guys will continue working on the rest of the hitch. There’s really not much left of it, once we figure in all the new parts I bought, and the replacement lower unit. We’ve decided to restore the famous Hensley orange paint (but a better, longer-lasting version, says Colin). I have some suspicions about that too. I figure it’s all a learning opportunity. For now there’s nothing to do but wait. Assuming everything goes as planned, we’ll have the hitch reassembled and ready in late July, just in time for us to launch again across the country. Our schedule calls for departure before August 1, in order to spend six weeks transiting the north country from Vermont to Seattle WA. It will be nice to take off knowing the hitch is back up to 100% again. We’ve never had Zip Dee chairs. I know, it’s almost blasphemous to admit it, especially after all these years of Airstreaming. 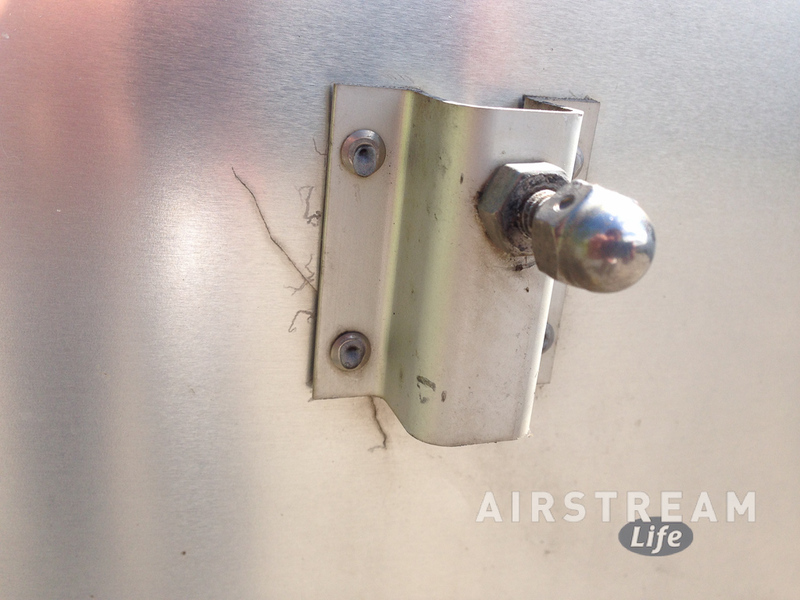 Zip Dee and Airstream go together like Ford and Firestone did before the war. 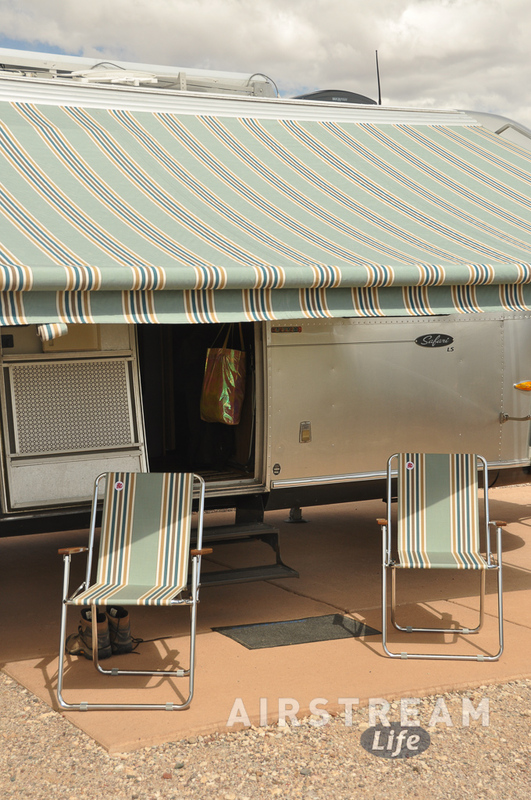 Zip Dee awnings have been original equipment on Airstreams for over 50 years, and the chairs go back about that far too. The relationship is so tight that most Airstreams have specific storage just for these wonderful folding chairs—but the 2004-2006 Safari bunkhouse was one of those that didn’t. And when we were full-timing, we just didn’t have room for any. So we never sat down. But these days we are making more opportunities to sit down under the awning and relax. So I took the plunge and ordered three Zip Dee chairs to match our awning, one chair for each of us. Of course, we still didn’t have anywhere to put them, so for the past few months those chairs have been riding in the back of the Mercedes. This wasn’t ideal (it was a pain to get them out from under all the other stuff we carry), so I asked Colin Hyde to put on his genius beanie and figure out a solution for me. 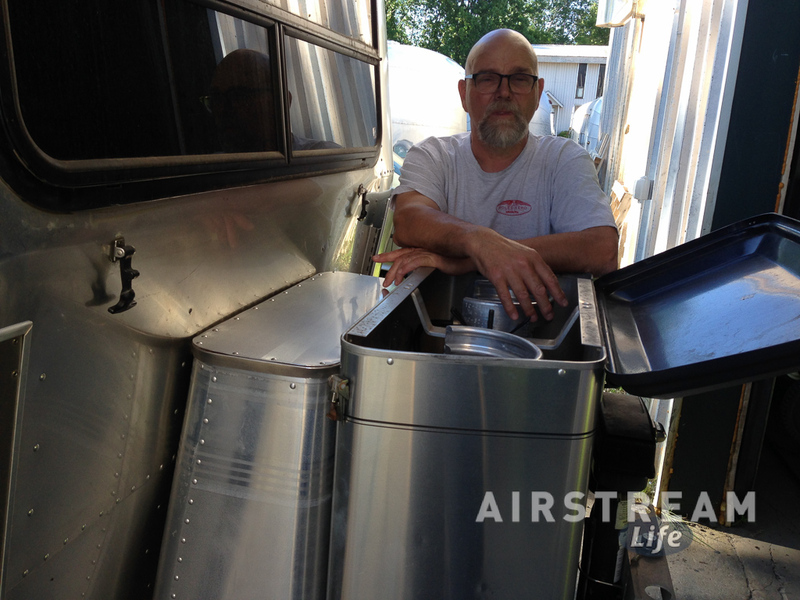 His inspiration came in the form of an old propane tank cover from a 1980s Airstream Excella, which was for sale in the Alumapalooza Swap Meet for $25. At Colin’s suggestion I bought it and brought it to his shop when we came in for the major front end repair. 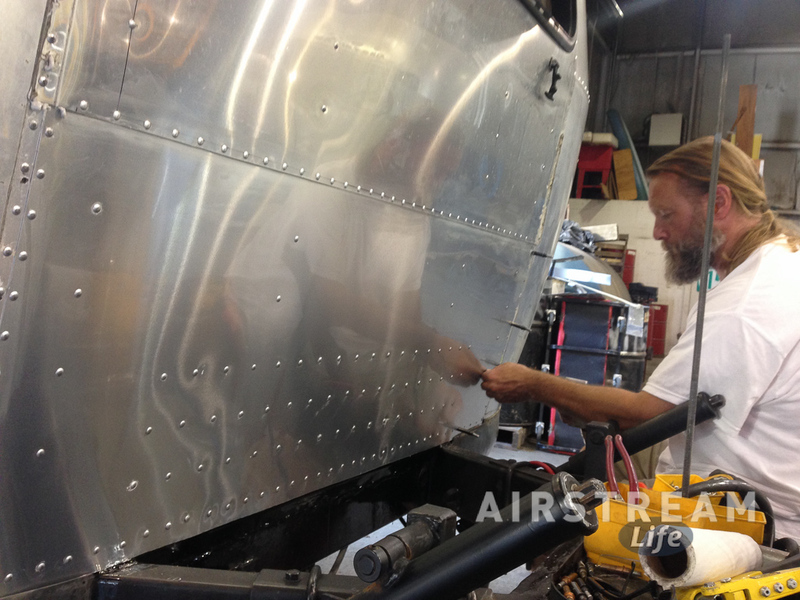 As the front end work was being done, the guys fabricated a pair of steel braces where the battery box used to be, and began cutting down the Excella propane tank cover to the exact size and trapezoidal shape needed to fit tightly between the real propane tanks and the Airstream’s body. You can see those braces below. They are awaiting drilling and paint at this point in the job. Note how they rise up to hold the chair storage above the hitch parts on the A-frame. With the front hatch gone, this is empty space so it makes sense to put something here. I’m not really doing justice to the amount of work that went into this. The modification of a propane tank cover into a very different shape was complicated, and in retrospect it might have been easier just to start with new aluminum. Colin has some very talented guys on his crew, and what they did to make this cover—with weathertight base and top— was impressive. It even has bucked rivets! But it was a ridiculous amount of work. Colin says he does not plan to ever make one again, so don’t ask. The photo at right shows the chair storage with the lid open. You just open the lid and lift the chairs out, which is easy. The box stays in place, unlike the propane tank cover. This is a “beta” version. I may add some weatherstripping to the lid later. It might also get a latch, if we find the tight-fitting lid pops open during travel. There are already a couple of drain holes in case water collects inside the box. The box can hold four chairs, believe it or not. Right now we are using cardboard to separate the chairs and fill some space since we only have three chairs at present. A bit of Prodex insulation is fitted into the bottom to prevent chafing. Later I’ll get two Zip Dee Chair Bags (each one holds two chairs), which will protect the chairs and give us handles to lift them out, so we can ditch the cardboard. If you’re wondering about the net impact on tongue weight, it’s probably about the same as it was from the factory. We’ve made many modifications over the years (switching aluminum propane tanks, relocating battery rearward, deleting hatch and steel battery box, adding chair storage) so it’s hard to gauge the net effect without going to the truck scale. I’ll do that soon, but the weight of the braces, aluminum box, and three chairs is only about 35-40 pounds. I really love this addition. It looks Airstream-y (meaning cool), it’s practical, and it makes use of otherwise-wasted space on the A-frame. I can’t really cost-justify it but I love it all the same. And now we can finally escape the stigma of not having any Zip Dee chairs in our Airstream. OK, brace yourself. This post is going to get detailed, forensic, and possibly scary to the faint hearted. 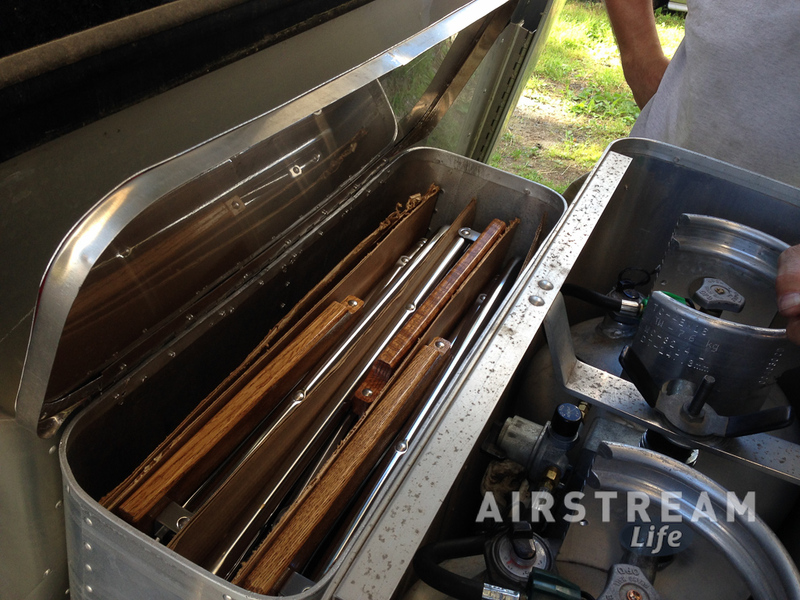 We’re going to do surgery on the Airstream. 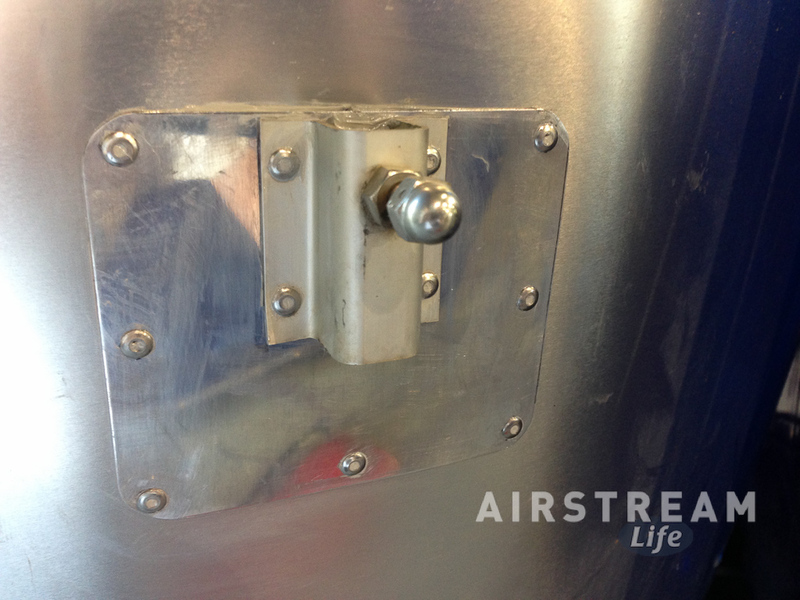 Let me start with a little about how a modern Airstream is put together. The aluminum body rests on a steel frame (or chassis) and is fastened down around the perimeter to that chassis. This is “semi-monocoque” construction, which is normally pretty strong. The body and the chassis work to support each other, and as long as they are well tied together everything goes well. 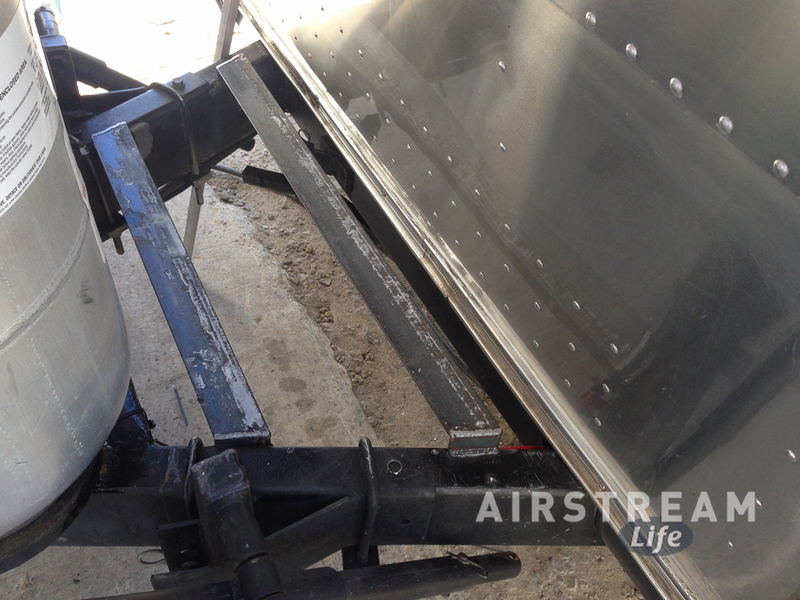 Now think of the Airstream’s body as a teeter-totter, with the axles being the fulcrum. In normal towing the rear of the trailer is bouncing up and down on the road a little. With every bump, as the rear goes down, the front end is being pulled upward from the chassis. 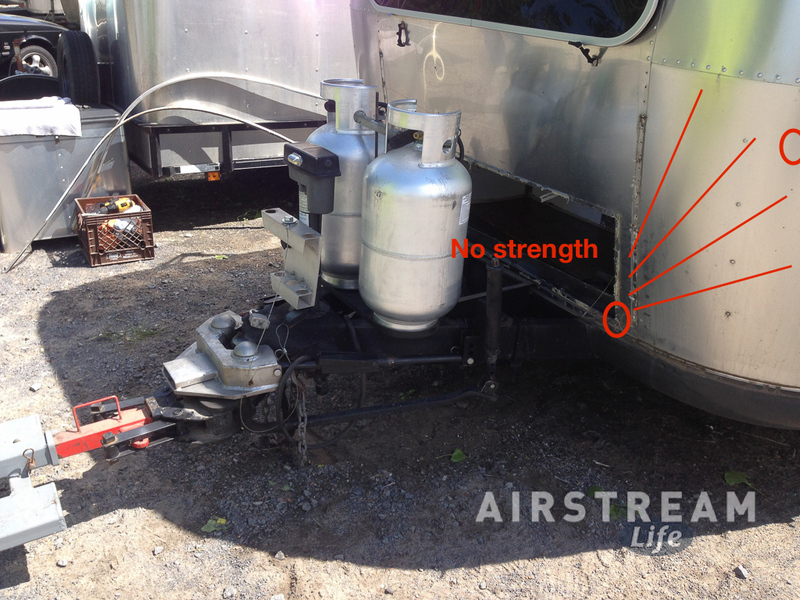 Since the chassis of the trailer is held down at the front by the tow vehicle, there’s a lot of strain on the chassis-body connection. The longer the trailer, the more force is put on the front end. When the attachment between chassis and the front of the body loosens, that’s “front end separation.” Essentially the body is now banging on the chassis rather than being firmly tied to it. As separate units, the body and chassis are now both weaker and they start to beat each other up. The visual symptoms are things like broken rivets, stress cracks in the body, mangled aluminum and gaps around the lower edge, and other things. Now before you panic, let me point out emphatically that all Airstreams (and for that matter, all RVs of any type) will normally flex some as they travel. They can even flex a little when they are parked if you crank the stabilizer jacks too much. So some movement is good–it’s a way to distribute stress across the body structure. Airstreams are not designed to be rigid, just like a bridge or the wing of a jet. If the wing of a jet couldn’t flex in turbulence, it would just break off. But separate movement of the body and chassis means problems. Longer trailers are particularly likely to have this problem, and they often have a particular symptom when they are flexing too much at the front end: they develop a fatigue crack in the skin just above and forward of the entry door. On 30-foot bunkhouses like ours, the cracks first seem to appear at the corners of the front compartment hatch–and other places, as we discovered. Here’s a photo at the beginning of the project. The front wrap protectors have been removed along with the lower beltline trim and the hatch door. With the door removed, it’s more clear how little structure existed to spread out stresses that are transferred from the main frame members (A-frame) through the body. The circles show the approximate locations of cracks that appeared, and the red lines show theoretical lines of stress. 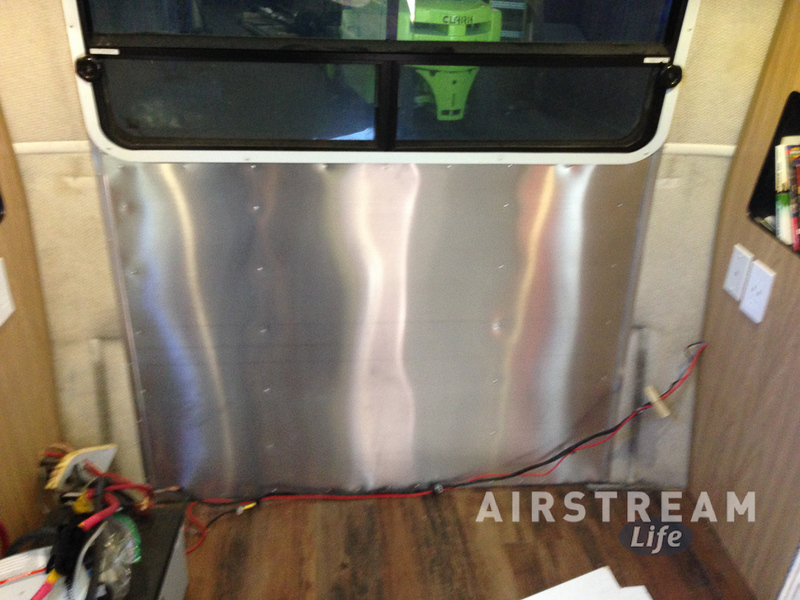 The front is a high stress area, so in older Airstreams there’s sometimes a steel plate installed that extends upward from the chassis to the front panel of the aluminum body, connected by two or three rows of rivets. Obviously that wasn’t possible with this front hatch design. 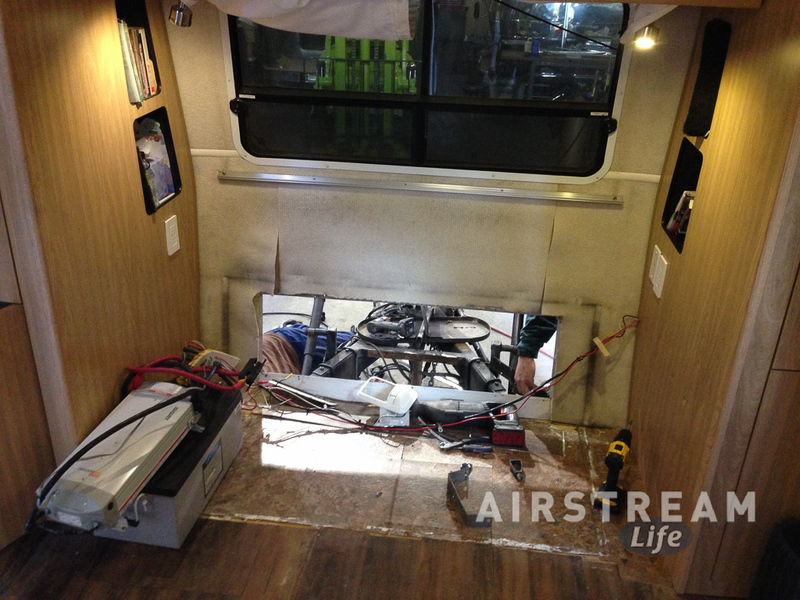 We struggled with leaks through this compartment because the door fit differently depending on whether the trailer was hitched up or not, and also the door would jam shut when the weight bars were tightened. These two photos show cracks we didn’t know about until the front wrap protectors were removed. This is the mounting point for the wrap protectors. Both mounting points (on opposite sides of the trailer) had the same cracks because they were weak points. 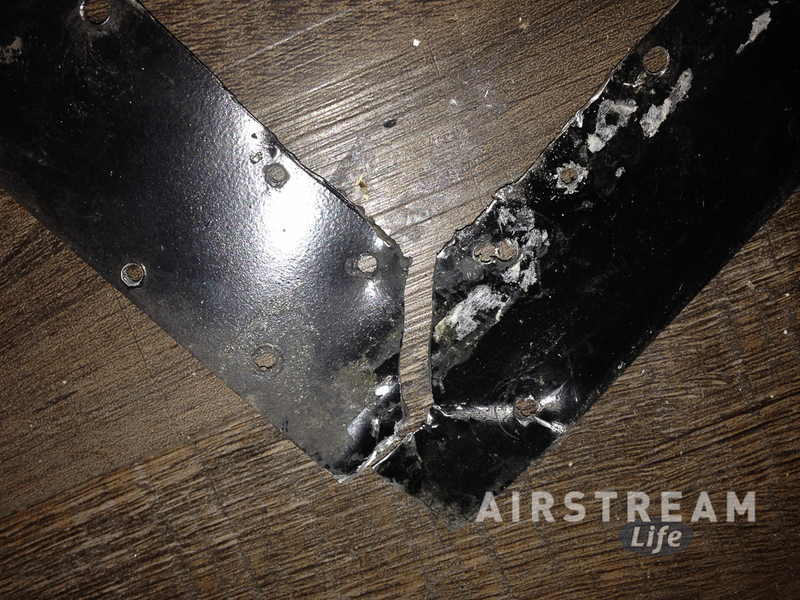 The cracks are the result of metal fatigue from repeated flexing. These cracks were definitely letting rainwater in, which is of course the cause of floor rot, so it was yet another reminder of how serious the side effects of front end separation can be. 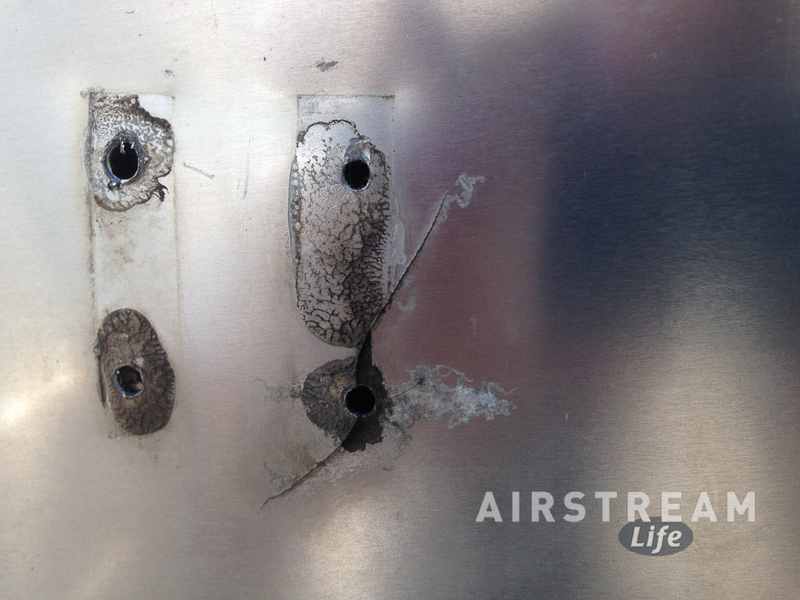 The cracked spots were fixed with a new aluminum plate and sealant, as shown in the third image. But this was only treating a symptom. The real problem was down where the body and chassis were joined. The photo above shows a reinforcement that was installed in 2008 by a dealer’s service center. They basically slipped some cut aluminum behind the existing exterior skin around the hatch in the hope of adding strength to the corners of the door. You can see how well that worked: completely cracked through. This patch basically replaced a weak spot with another weak spot—and again, it was only treating the symptom. It didn’t do anything to strengthen the body-chassis connection. To fix this right, we made the tough decision to eliminate the hatch entirely. This would allow Colin’s guys to fabricate and install two additional ribs, and attach those ribs to the existing ribs plus the new steel frame plate and a single sheet of aluminum on the inside and outside. In other words, we were replacing a big hole and 16 rivets with a battleship-like sandwich of aluminum, steel, and 160 new rivets. I pitched in a little by removing the front bed and frame, lower curtain track, and all our personal stuff. 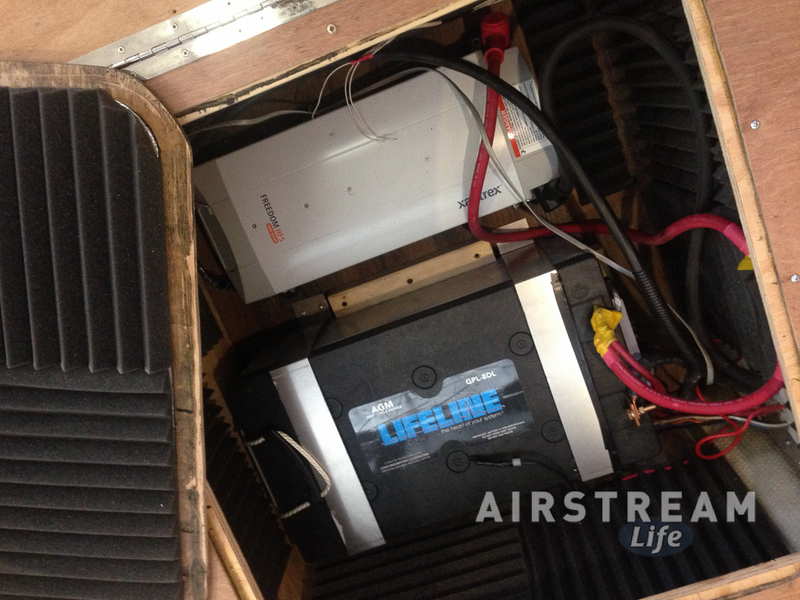 This left only the big Lifeline 8D AGM battery and the Xantrex Freedom HFS converter/charger/inverter that we installed in January, plus some wiring. The different colored floor tiles at the front end were installed way back in March 2006 when the front compartment first began leaking. Since we now had everything out, this was a good chance to remove those tiles and finish the floor with walnut (vinyl) flooring to match the rest, so I ran out to Lowe’s and bought a box of planks and installed them. Now, compare that photo above with the one below. Notice the two new ribs coming all the way down to the floor where the compartment used to be, and the black steel plate with three rows of rivets firmly attaching it to the body and ribs. That plate is welded to the steel frame below. It takes the stress between the body and chassis and distributes it, rather than concentrating it on a few weak spots. That’s the key: you can’t eliminate the stress, so you spread it out instead. The photo below was taken a little earlier in the process. It shows how the steel frame plate was welded to the frame. Notice that in our case we chose to remove the old battery box that hung between the frame members. We weren’t using it, and it was in the way. The next photo shows the exterior work nearly done. Joe is bucking rivets with Chris (inside). Buck riveting is a two-man job and it requires access to both sides, which is why Olympic-style rivets are often used for exterior repairs. But buck rivets are far stronger. Notice five rows of rivets horizontally (four on the steel frame plate and one at the aluminum panel joint above) and four vertical rows added to the ribs (plus two vertical rows that were pre-existing and two rows for the vertical aluminum panel joint). Seriously strong. The blurry photo at right shows the interior when done. We didn’t put the white fuzzy Ozite fabric back, as we aren’t really in love with the stuff, and opted instead for a single sheet of aluminum. The new flooring is in place also. By this point I had been living in Colin’s parking lot for three nights, and we still had a lot of problems left to solve. For one thing, we no longer had access to the storage space under the head of the bed. Also, I wanted to muffle the fan on the Xantrex, since it’s right under Eleanor’s head and it runs when the converter is bulk charging the battery. The solution was a pair of new hatches. 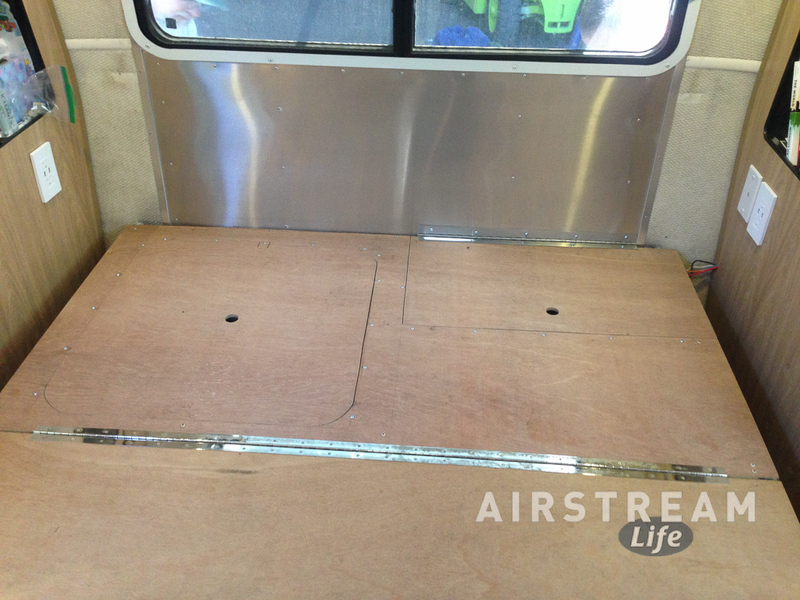 We divided the compartment with a 1/2″ plywood bulkhead. The left hatch contains the battery and Xantrex; the right side is “dead storage”. The battery is now secured with two big straps. If we have a catastrophic accident, it won’t go flying and possibly short against something (which could cause a fire). Also, since the battery no longer shares space with any stored items, we’ve eliminated the chance that some metallic object might accidentally contact the positive lead on the battery (which would cause a huge spark at the very least). To soundproof the compartment, I lined it with acoustical foam used in recording studios. On the underside of the bed platform (the hatch) I layered the foam over heavy automotive sound-deadening material. We will have to pull the mattress out entirely to access this compartment, but since there are no routine maintenance items in there, it shouldn’t need to be opened very often. You can see in an earlier photo that the right side hatch is much smaller. We designed this so that we could simply slide the mattress toward the bedroom door to expose this hatch. There’s a piano hinge at the very front edge. Lying on the bed, it’s easy to put things into the compartment below. We will continue to use this as dead storage for things we need only rarely. Funny thing is, it’s easier to access now than it was through the old front hatch, and so I was able to pack everything we were carrying before into a space half the size! There’s even more that we did in this service visit at Colin Hyde Trailer Restorations, but I’ll wait for the next blog to talk about that. Just a hint: it’s a really cool improvement that I don’t think anyone else has. 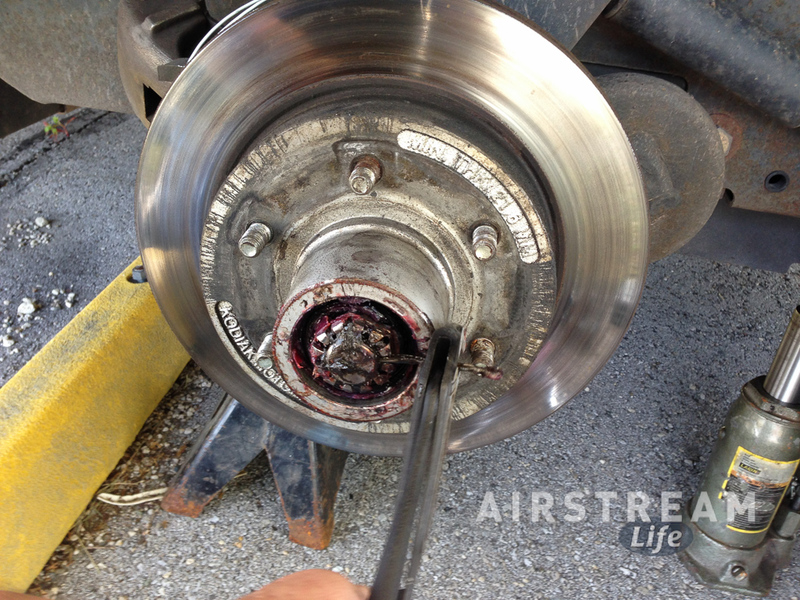 In the last blog I talked about the wheel bearing replacement we did while in Jackson Center, and it occurred to me that you might wonder why I don’t just take the trailer into the Airstream Service Center for this sort of routine stuff. The reason is simple: no time. We arrive for Alumapalooza set-up usually on the Friday or Saturday of Memorial Day weekend. The Service Center is booked up solid for at least a week or two before the event, and a week or two after Alumapalooza is over. Everyone always thinks that Airstream will do me special favors like building me custom trailers and opening the Service Center on a weekend, while the reality is that I have to book appointments just like everyone else. Besides, going into the shop for work anytime before, during, or after Alumapalooza is a non-starter for us. We’re already too busy at that time, and losing the trailer for a day while working an event would really screw us up. So although we have utilized the Service Center many times in the past, it never works out at this particular time, and that’s why Super Terry (an experienced Airstream mechanic) pitches in. We have had an odd little problem for the past couple of years, which had gradually gotten worse. When using the water pump, the LED lights flickered—to the point of strobing in a very disconcerting way. We’ve also been getting massive interference on the TV when the pump runs. I have bounced this problem off numerous people in the past, and their suggestions have always been around the idea that the pump is drawing down the voltage, and that therefore the solution is some sort of capacitor or filter to smooth out the voltage drops and spikes. Another popular theory is that the battery is weak, but we eliminated that as a possibility when we replaced the battery in January of this year. I’ve resisted the voltage theory even though it is appealing. No question that LED lights are very sensitive to low voltage, but at worst they should be dimming a little, not strobing on and off rapidly. Also, we didn’t need a capacitor when we first got the LED bulbs in July 2012, so clearly something has changed. And I needed to find out what it was before we all went nuts from living in a disco. While in Fort Collins CO at the Denver Unit’s “May-tenance Rally” I had a chance to ask Von Campbell, an electrical engineer, and he immediately suggested that the brushes in the water pump’s motor were wearing out. This would cause electrical arcing, he explained, and that would definitely cause noise in the 12 volt DC power lines. This struck me as the winning answer, so I asked Super Terry to bring a new water pump to Ohio and install it for me. Bingo! Problem solved. Now the lights dim slightly when the pump is running, but they do not flicker or strobe. The interference on the TV is also now barely noticeable. I guess when all the parts are 12 years old and have been used for … what? maybe 2,000 nights? … we’ve got to expect to replace a few things. As with the wheel bearings, I can’t really complain. Another issue we had was with the MaxxFan in the front bedroom. It often whines or makes an annoying resonance at certain speeds now. It used to be very quiet. Since we sometimes run this fan on hot nights, it’s important that it be quiet. I noticed that the fan seemed to be slightly out of balance, and attributed the problem to that, but replacing the fan blades didn’t help (it still wobbles). Now I’m thinking the problem is the motor itself. Super Terry brought me a broken MaxxFan, for parts. I stripped it down one afternoon, keeping the motor, circuit board, and a few other small parts. Later I plan to swap out the motor and see if that resolves the issue. It’s a lot easier to swap a motor than to replace the entire fan assembly (and hey, the motor was free). You may recall that while traveling through Colorado we had some trouble with the refrigerator, and my theory was contamination in the propane lines. I asked Super Terry to bring his air compressor along and we used that to blow out the lines running from the refrigerator to the propane regulator up front. No surprise–we collected about a teaspoon of dark brown oil on some paper towel in just a minute or two. 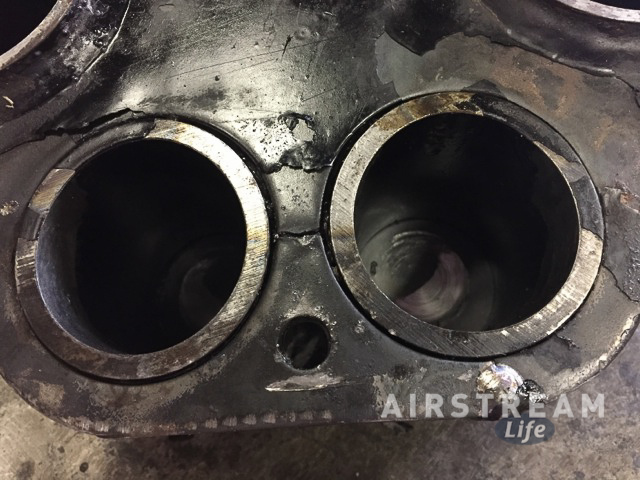 Oil Residues and Heavy Hydrocarbons … This type of potential contamination can vary from very light oil to a very viscous tar-like substance. Sometimes it is a waxy material like paraffin, or it may be similar in consistency to axle grease. Sometimes it is transparent (no apparent color) while at other times it is light brown, dark brown, or even black. It usually has a strong odorant smell, as the ethyl mercaptan used as an odorant in propane appears to concentrate in the oily residues. Source: The oils in propane can come from many sources; from processing, pipelines, pumps or compressors, piping systems, and flexible hoses. The refrigerator had been running on gas without problems for a few days, so it was interesting to note how much oil was still left in the lines. I suspected we hadn’t seen the last of this problem, and sure enough it cropped up again about two weeks later in Plattsburgh when we finished one tank and switched to the suspicious one. The fridge gave me grief for a few hours but has been fine since. I may blow out the lines one more time at the end of this summer, when that tank is nearly empty. There was one more repair item along the way. While driving through Pennsylvania the GL’s “CHECK ENGINE” light came on. I didn’t even have to pull out my new engine diagnostic tool (code checker) to guess that it was once again a stupid emissions problem. The car is great but the complicated Bluetec diesel emissions system has been the cause of most of our service stops, and usually it’s not a real emissions problem but a sensor or software update needed. We made a stop at Mercedes Benz of Lancaster (PA), where it just happens we know the general manager Chris through Airstream circles and he made sure the dealership took excellent care of us. The problem was a NOX (nitrogen oxide) sensor, which is an expensive part but fortunately replaced fairly quickly. Chris arranged for us to be able to drop the Airstream in their parking lot and offered use of his house nearby for overnight parking. Sweet. Clearly it was not a bad place to spend the night. Too bad it was too chilly to try the pool! 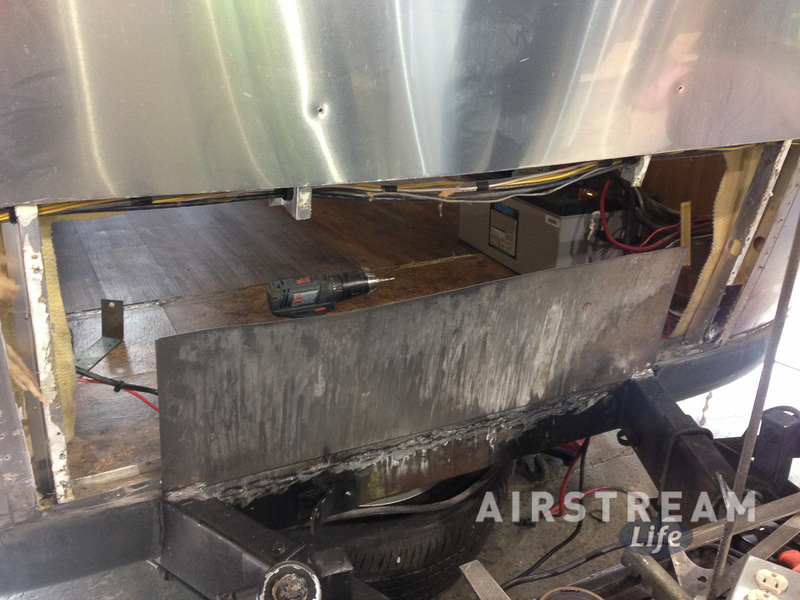 Our next major stop was Plattsburgh NY, at Colin Hyde Trailer Restorations for a long-anticipated major repair and upgrades to the Airstream. That’s quite a story, so I’ll save it for the next blog entry in a day or two—along with extensive photos. Since I wrote a book about Airstream maintenance I feel a certain pressure to keep my own Airstream reasonably presentable and in good condition. Had I realized I would feel this way before I might never have written the book, since once in a while it would be nice to be lazy about things. But now if something catastrophic happens that I could have avoided with proper maintenance, nobody will ever let me hear the end of it. So with this mind I planned ahead for our trip. 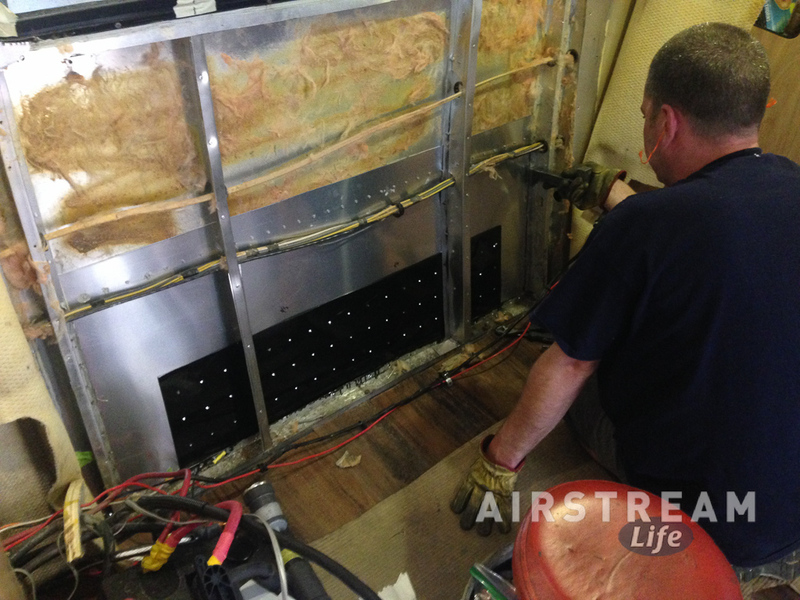 It has become routine in the past few years for Super Terry and I to do a few light maintenance items on the Airstream in the days leading up to Alumapalooza. 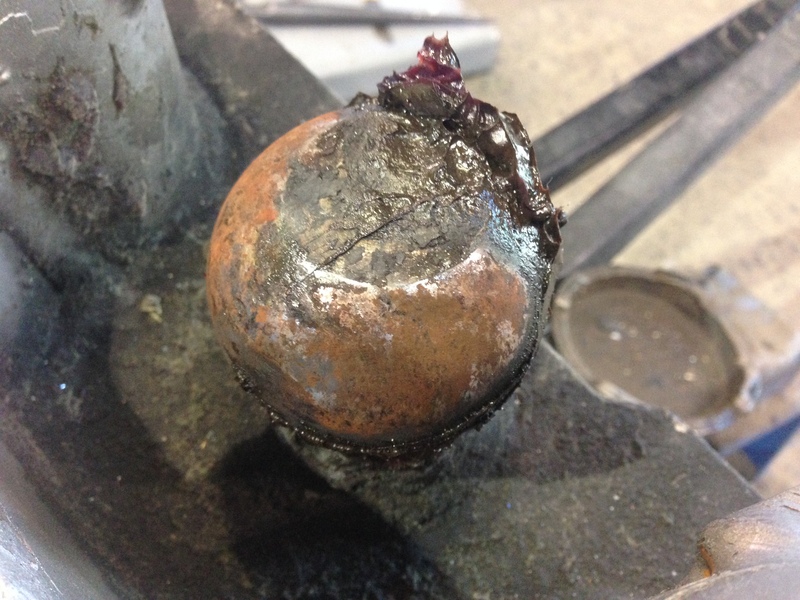 This year we decided to repack the wheel bearings, a job we do about every two to three years. 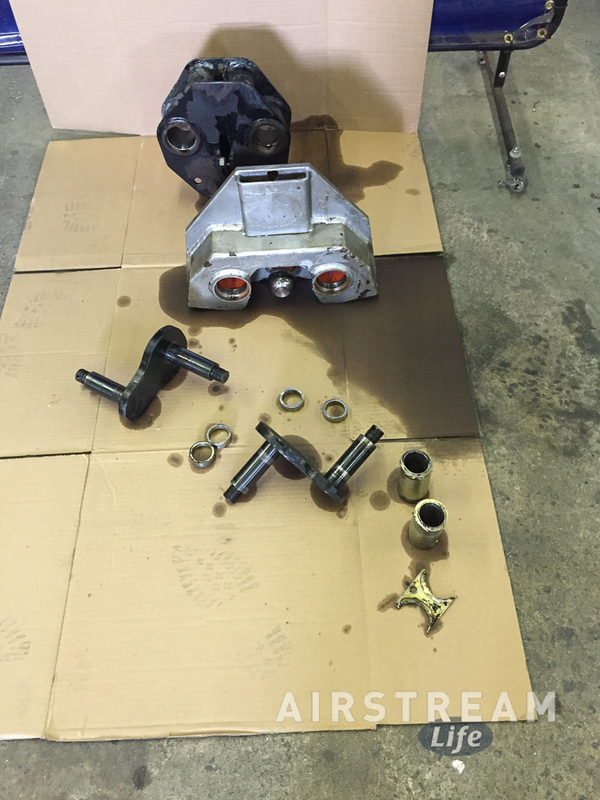 The industry recommendation is to do this service annually, but since we tow our Airstream a lot (using the bearings is better then letting them sit) and we are mostly in a dry climate (water contamination is a common problem for the grease) I choose to let it go a little longer. This time Super Terry decided the bearings looked a little worn and he called for total replacement. This was probably overkill, as really only a couple of the bearings looked slightly questionable, but my philosophy has been not to economize on maintenance issues. I could probably get a couple more years out of the bearings without a problem, but it wouldn’t seem like much of a savings if a bearing failed on the road. The result could easily be that we’d need a new tire, axle, bearing set, and possibly some body work if the wheel came off. As it was, we have gotten 12 years and probably over 140,000 miles of service out of these bearings. They were original equipment. I can’t complain about not getting my money’s worth out of them. A full set of bearings (8 pieces in total) plus races was about $120 at the local parts stores in Wapakoneta OH. Pulling the wheels and replacing the bearings took half the day. It probably would have taken Super Terry only about two hours at his shop, but we had a lot of people dropping by to ask questions. The brakes, by the way, looked excellent. We are getting absolutely amazing service from the Kodiak disc brakes with semi-metallic pads. We installed these pads in January 2010 and since then have only replaced one set in May 2013 that wore out prematurely due to a lubrication failure. No service was needed on this inspection, which is great news. Likewise, I’ve been super pleased with the Dexter brake actuator we installed in January 2012—absolutely flawless. There were a few other minor maintenance items we covered that weekend, but I’ll talk about them in a separate blog this week.